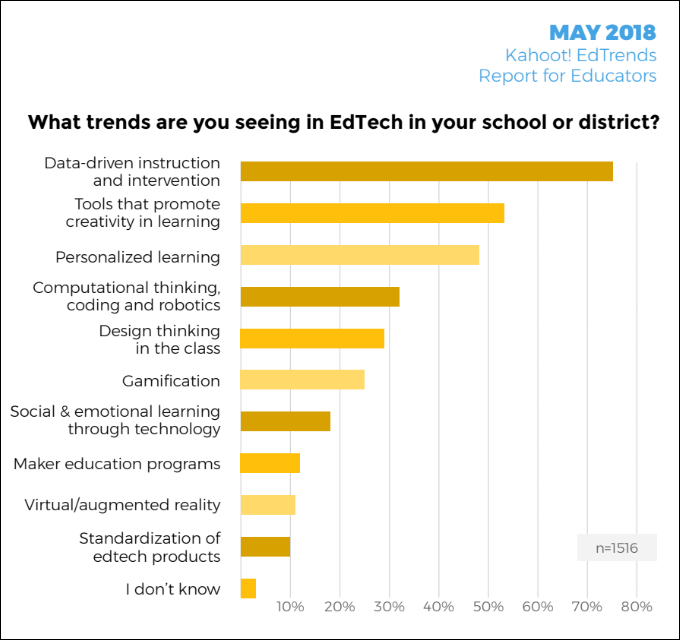 This year, three out of four teachers identified data-driven instruction as the top trend they see in how ed-tech is used their schools. That compares to only 28 percent who named data usage as a trend in 2017, which is the first year the survey was conducted by the game-based learning platform company. Other trends include using ed-tech tools that promote creativity in learning, and ed-tech for personalized learning, according to the study. “Gamification,” or the use of games to engage students, is on the increase, from 18 percent in 2017 to 25 percent of teachers saying the technique is used in the class or district in 2018. Asmund Furuseth, CEO of Kahoot!, attributed this growth to the fact that educators are allowing games to be used more in classrooms now than they were one or more years ago. Formative assessments are the main data generator for educators looking to improve student performance, 83 percent of them said. Fewer—72 percent—rely on data from summative assessments, but that was the second most-often cited dataset consulted for instruction. Data are also used to identify gaps in learning. More than 50 percent of respondents say they combine different sources of data to identify student needs. The following chart shows specifics about how data are used, although a spokesman for Kahoot! indicated that “conducting” formative and summative assessments should be interpreted as “implementing” or “using” them. 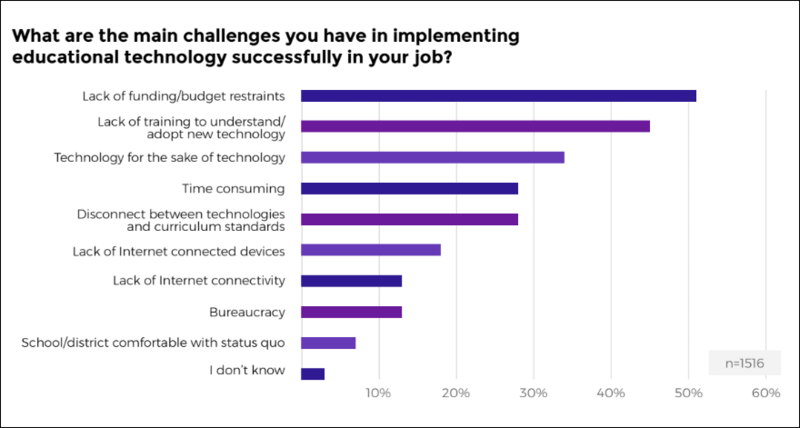 Despite the gains, there are still impediments to the use of ed tech, according to teachers who responded to the survey. The two biggest are funding, which just over 50 percent said was problematic, and lack of training in how to use new technology. More than a fourth of educators—27 percent—have personally paid for ed-tech products, rather than tapping into their district’s or school’s budgets. The study found that educators in California and Texas were most likely to struggle with the lack of funding and lack of connectivity: 12 percent of teachers in California who responded said they experience lack of internet connectivity and 11 percent of Texas teachers made the same claim. Lack of training often translates into educators’ lack of time to go for training that would make the technology even more useful, said Furuseth. The company also asked educators how they’re using technology to work on 21st-century skills: collaboration and teamwork; creativity and imagination; critical thinking and problem solving, and communication. Nearly two-thirds are using technology to encourage working in teams, and 58 percent are using it for problem-based learning. More than half (55 percent) are using it to encourage creative thinking. Looking ahead, Furuseth said there is likely to be more emphasis on students’ ability to share ideas with teachers using technology, which is an important aspect of 21st-century skills. “This is an area we call ‘learner to leader,'” he said. It’s a trend the owners of the Kahoot! platform are noticing among what the company says are more than 70 million monthly users, including more than 50 percent of U.S. K-12 students.